It needs saying, and it needs saying loud: 2015 has been another great year for Reebok retros. With the Ventilators‘ 25th Anniversary came the OG’s then dozens of stunning collabs. A smorgasbord of LX 8500 makeups and collabs appeared – some blurring the line between the shoe and its’ fabric/mesh brethren the GL 6000. Read on…. The Ventilator II and Ventilator Supreme retros dropped too; The Supreme is one of Reebok Classics most aggressive shoes; once perhaps taking the fight to the Nike Air Max (in my mind at least). ‘New retros’ Furylight and Ventilator Adapt were released; the Furylight has clearly been a success for Reebok Classics, with dozens of makeups released particularly in the latter half of 2015. Then there was the Bolton; not dissimiliar in construction to the Supreme (that silhouette, toebox, and colour-blocking). Personally, it was the attention to detail and accuracy of the legendary OG Aztec released back in August that takes the award for 2015 ‘Retrobok’ release. When you experience that shoe, you start to understand what Reebok was all about: handmade, lightweight, innovative footwear for serious athletes. Gold stitched starcrest on the tongue? Cherry on the damn cake. This all got me thinking; what would I (and we) like to see in 2016? Reebok Classics are still sitting on dozens and dozens of unvisited retros, as well as many US-born BBallers, something I needed to reach out to friends to help guide me on. Without further ado, let’s get started. With current sneaker technology achieving ever lighter single-composition sock-like uppers, Reebok Classics could provide the ultimate knowing wink by re-releasing the rare and barely-know brethren to the Paris Runner; the mid-80’s Paris Racer. With the ERS 1000 retro’d in 2009, the 2000 in 2013, and the 5000 in 2009 (see ‘Gold Marilyn’ and ‘Maeda Reduce’ collabs for the boldest proof of those) the handsome ERS 4000 appears to have been missed out. It’s possible I’ve missed out on a re-release, not helped by a slightly confusing dual-naming of shoes like the ERS Trainer (aka ERS 1000), the ERS 3000 (aka Sole Trainer 3000) ERS 2000 (aka Questor), the ERS 5000 (aka Sole Trainer 5000 II or is it Mentor II?) aaaaargggh! WHATEVER, that ERS 4000 is a handsome devil with some upper detailing similar to the World Best and PB – and clearly screams NINETIES! and RETRO ME NOW! I could (and should) list the Vertical II, III or beyond, but it was the Vert 1 that saw the start of bolder, crazier designs on Reebok 90’s BBallers – so why not start with retro’ing the original before moving onwards? Right at the budget end of Reeboks casual/trainer line sat the Rapide. At £19.99 in 1988 it was less than half the price of the then top-of-the-line ERS World Trainer at £49.95. The shoe used all of Reeboks knowledge, but on a budget. It was light, simple and worked. It was also my first pair of Reebok Classics. The Rapide name lived on into the 90’s fulfilling its cheaper pricepoint and releasing in a number of mildly colourful makeups. Retrobok has been aware of a teaser photo from 2013 so it’s high time for Reebok Classics to drop this little budget gem once again. A solid retro of these would take pride of place front and centre in my own collection. ‘Forefoot and rearfoot Hexalite® material for cushioning. CMEVA midsole and inner booty for a comfortable fit”. 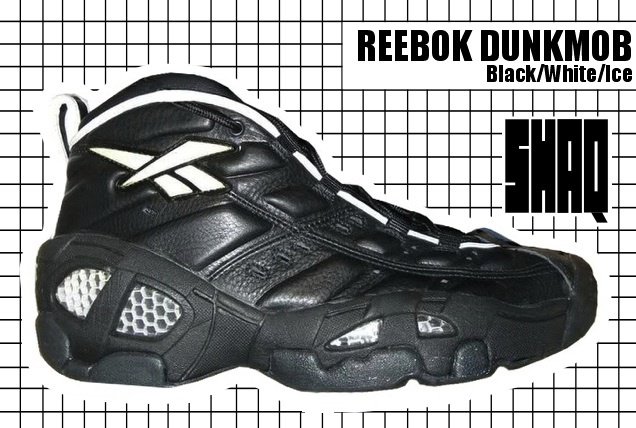 The Dunkmob has a similar appearance to the Reebok Preacher – both had Hexalite side windows providing a very hi-tec appearance. And man, this thing looked like it would last forever. A ‘road and Trails shoe’, and cheaper than the Phase II and ERS trainers in 1988, the DL 1400 nudged the Reebok silhouette design forwards with their ‘full-reach’ sidestripes looping from around the heel tab down to the midsole. The DL range also promised good motion stability – something the GL 6XXX series had used as a key sales point a few years earlier. With 2015 seeing the finest retro release of the 1978 OG Aztec, Reebok Classics could provide a breathtaking follow-up by retroing the Aztec II (or AZ II as can be seen in the catalogue image above). The AZ II hasn’t been retro’d since 2002 – so its clearly a good time to consider a truly on-point re-release. Retrobok truly hopes to see one or more of these retro’d this year. Reebok Classics we’re looking at you 😉 Happy New year from Retrobok! Thanks to Ritchie, Brad Spriggs and BokTwo (DIXY) for their invaluable help with this article. Posted on January 2, 2016, in Newsfeed and tagged Energy Return System, Reebok Classics, Reebok ERS, Retrobok. Bookmark the permalink. 8 Comments. Totally agree with the DL5600 – the best shoe they haven’t retroed. I personally want to see DL5000, DL6000 and CL1400 (in all 3 colours) as well. I won’t complain if they throw in an OG-colourway Royale, either. News about Reebok OUTRAGE or SXT return ? Not seen anything I’m afraid, Fjop. The Dynamic Cradle was used on DL5000 and DL 6000, but not on the DL5600 or DL1400. It is easy to spot – it is a really thick midsole, white lower, grey upper. The magic is inside – actually 3 different materials/densities, stacked and interlocked. It even says ‘Dynamic Cradle’ on the side! Great article, I’d love to see Reebok do the Cross Trainers of the early 90’s … CXT Ultra, AXT’s again, So many great sneakers that sit in the vault ….